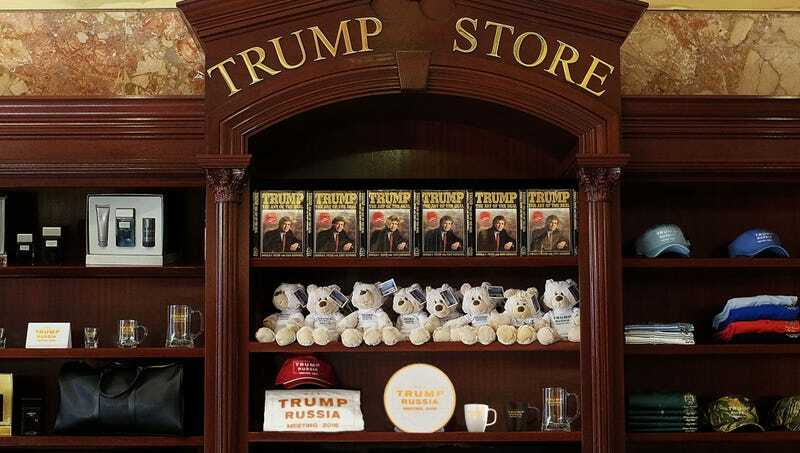 WASHINGTON—Saying the reports were a ludicrous attempt by the mainstream media to discredit him, President Donald Trump vehemently denied Monday the existence of 2016 Russia meeting commemorative merchandise available at the Trump Tower gift shop. “There is absolutely no evidence to suggest that exquisite, handcrafted Trump–Russia meeting decorative plates are on sale for just $39.99 per plate or $199.99 for the entire six-plate set,” said the president, noting that if such collectibles did exist, they would no doubt feature the portraits and signatures of those who attended the meeting as well as a bonus silver souvenir spoon hand-stamped with the date “6/9/16” at no extra charge. “Despite what CNN might tell you, there is no proof that special-edition T-shirts featuring my son Donald Jr. making a handshake deal with Russian nationals to provide our campaign with dirt on Hillary Clinton are going fast and won’t be on the racks for long. Furthermore, we cannot corroborate that a 2016 Russia Meeting stein handsomely emblazoned with the word ‘COLLUSION’ would make the perfect gift for birthdays, anniversaries, or graduations.” At press time, Trump denied that the low-low prices on the commemorative merchandise would be affected by recent tariffs on Chinese goods.